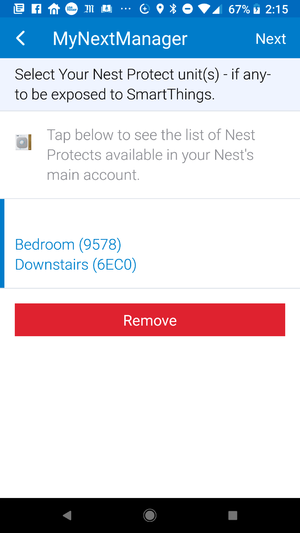 MyNextServiceMgr: the smartapp is the Service Manager for all Next devices (Tstat, Protects, Cams): it instantiates the Nest device(s) and polls them on a regular basis"
Notify you if there is any issue with the ST/Nest connection (optional). 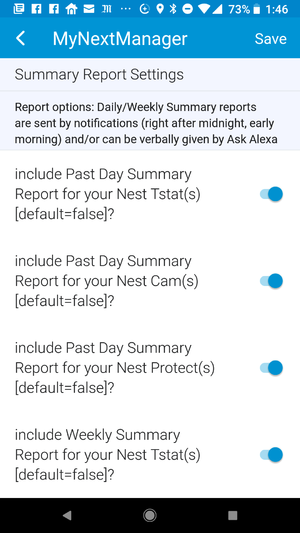 Can send summary reports via Ask Alexa and/or nofications about your Next devices' usage (weekly, daily). Hello only appears as a Nest Cam (not other special features). 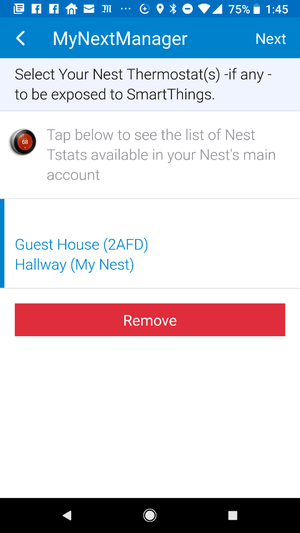 Nest setup completed for your Nest devices under your Nest Primary account (don't use any Nest secondary accounts for the integation with SmartThings!!). 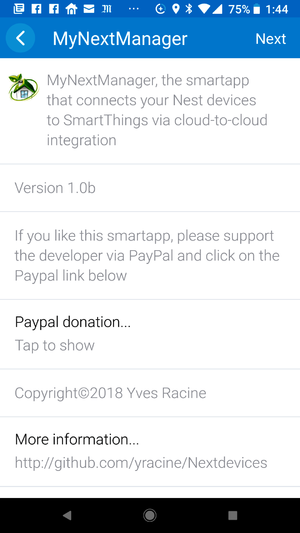 You'd need to execute the MyNextServiceMgr smartapp under Automation/Smartapps in the ST mobile app by doing "Next" till "Done" to subscribe to the new AskAlexaMQHandler. The new handler will then be able to process any Queue refresh value from Ask Alexa. 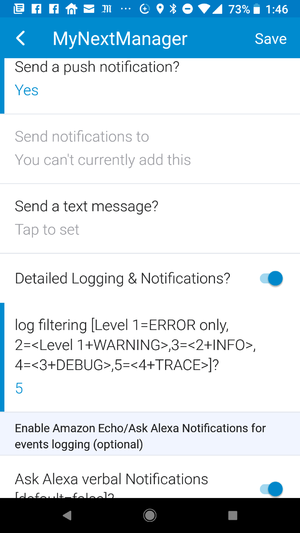 The smartapp will then send you notifications when exceptions occur. 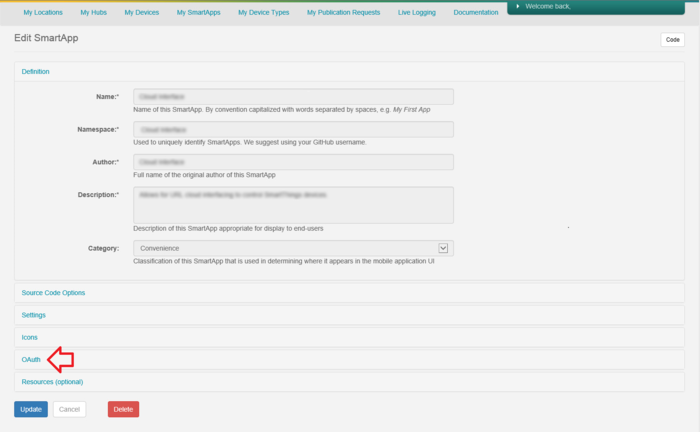 There are also variants of this message for devices: "(...) Nest Throtting in progress (...)" in the list of Events or the logs (IDE). 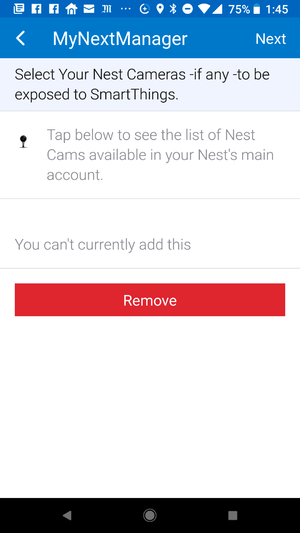 There could be different reasons why you have this exception thrown by Nest. "use of cached structures including devices?" 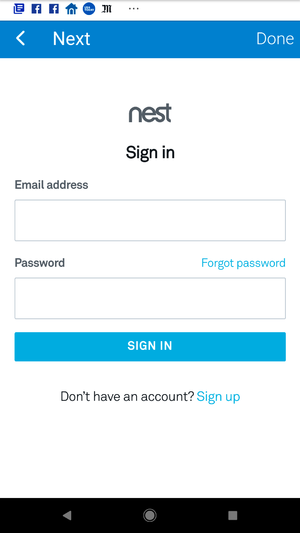 This means that every request to Nest will be sent without using any caching. This could be an issue as indicated in 2). 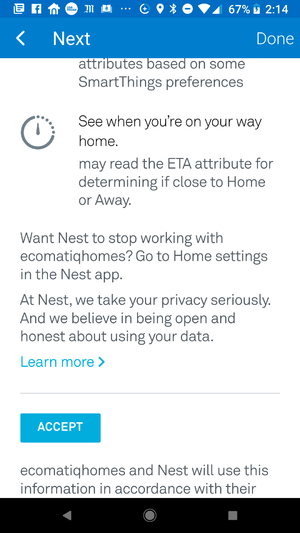 If your polling interval is 1-5 minutes, you may encounter this exception as Nest can throttle your requests when too many are sent in a given timeframe. 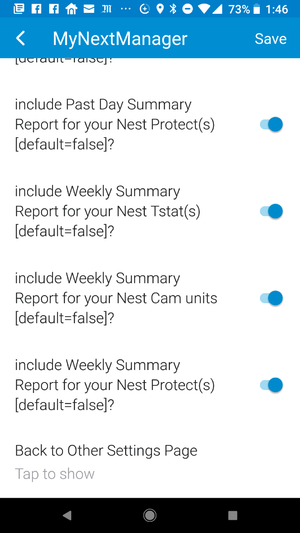 Nest APIs have 1 call per minute and 10 PUTs per hour limitations. 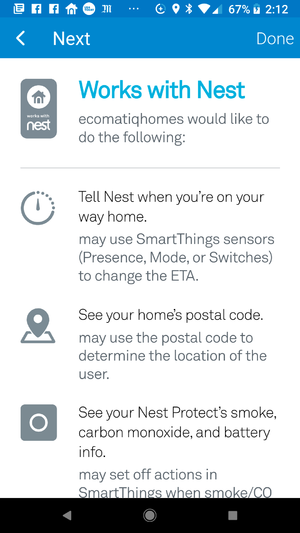 You may then need to increase the polling interval to 5-10 minutes, especially if you have many Nest devices under your account. 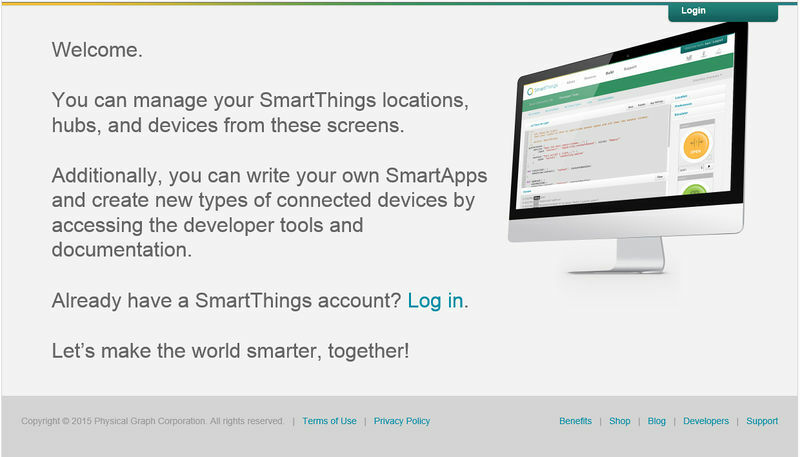 a) Like any SmartThings device, first you'd need to unselect My Next device(s) from all smartapps and/or routines (ex. Amazon echo). 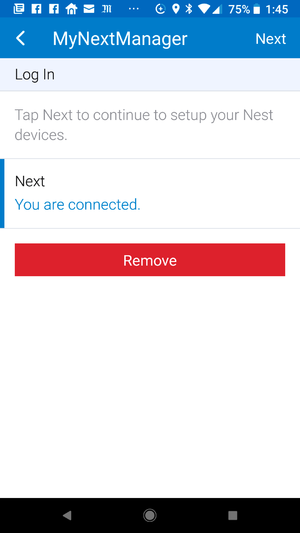 If you have Amazon echo, you need to deactivate the automatic discovery of devices first (i.e., in the ST classic mobile app, 'Allow access to all Devices, Scenes and Routines' in the Amazon smartapp under Automation/smartapps), before trying to remove any devices. 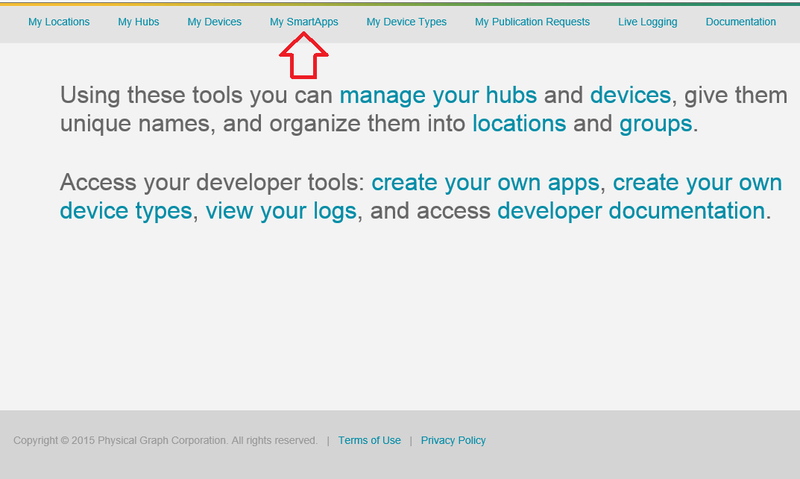 c) Then, you'd need to unselect the device(s) from the smartapps or routines using the ST mobile app. d) Finally, you can remove the MyNextServiceMgr smartapp by pressing on the corresponding 'button' inside it. 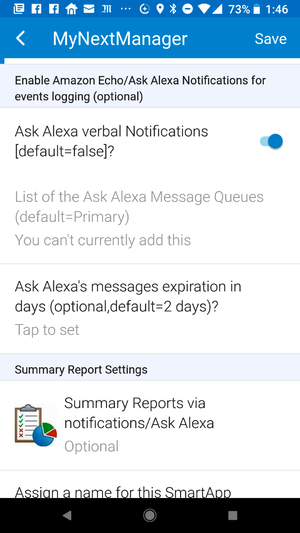 This way, you will get the same level of notifications (ERROR, WARNING, DEBUG,TRACE) verbally via the Ask Alexa smartapp. 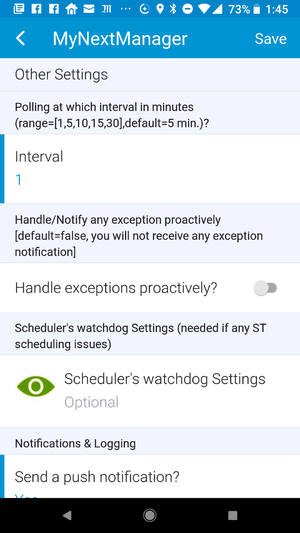 No custom DTHs can be created under the new Samsung mobile app for the moment as indicated in the prerequisites. You'd need to use the ST classic app to execute MyNextManager in order to create the Next devices. After creating the devices, follow the steps indicated in the installation pdf file included in the zip to force a refresh of the cache in order to make them appear correctly in the new Samsung app.